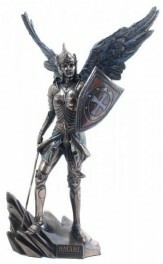 Raguel is referred to as the archangel of justice, fairness, harmony, and vengeance. Cold cast solid bronze figurine. Includes a collector's tag with extra info about Archangel.